Before arriving, I knew embarrassingly little about Lisbon. I could tell you where to find it on a map, and I made sure I knew a handful of phrases (“Do you speak English?” being one of them), but in my mind Lisbon was a vaguely sunny blank I decided to visit mainly because it was affordably reachable from Lyon. Lisbon is like an offbeat guy in a Hollywood high school movie who’s always in the corner of the cafeteria (or all the way at the western edge of the European continent) alone, and then one day you sit with him and find out his messy hair is actually kind of endearing and hides really soulful eyes, and he’s an amazing artist and nice to his parents and super athletic but doesn’t need to show it off, and he’s going to buy you beer this weekend because he’s in with the bartender downtown even though he’s only sixteen years old. 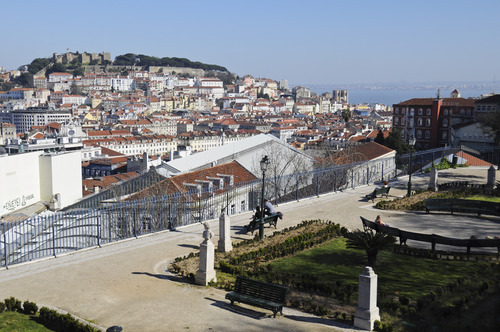 Lisbon, or Lisboa, the much more romantic-sounding Portuguese name for the city, is a real charmer. So much so that I was about ready to propose marriage to the cute Portuguese guy working at reception at my hostel so that I wouldn’t have to leave. It’s a major city with every modern convenience, but it also feels like a small village. The narrow streets are quiet, but you can hear muffled music thudding from some nearby cranny. There’s a feeling of private life being lived publicly, as it is in a small community – people hanging out in bars that are literally holes in the wall, families getting together at the restaurant they own before the dinner rush, people shouting to each other across the street. You as visitor are clearly Other, but no one’s going to stop you if you decide to join in. History-learning. I took a Sandemans New Europe tour, which are free (aside from tipping the guide) and have been interesting and worthwhile in every city I’ve taken them (Prague, Edinburgh, and Amsterdam). This one covered earthquakes, spies, and revolutions, and I left feeling like I actually knew something about Lisbon’s history and culture. Tile-spotting. 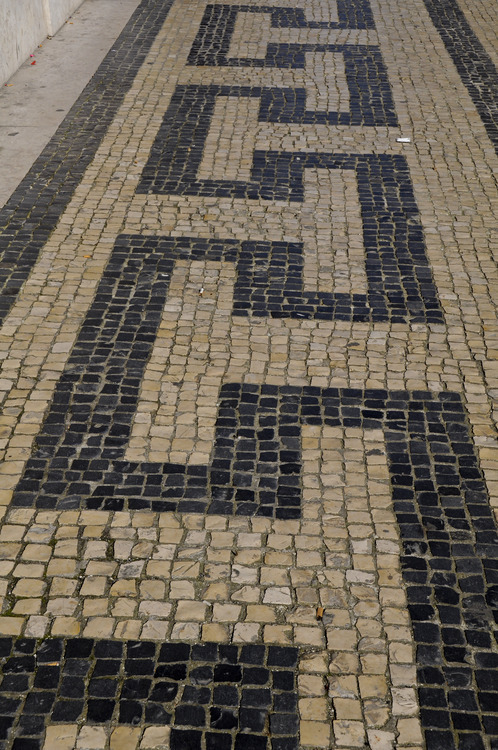 The sidewalks are paved with mosaics that reflect the streetlights like a fish’s scales, and many of the buildings are covered in square decorative ceramic tiles in all different patterns and colors. Every street is a lovely surprise. Tasting. There are a number of foods particular to the city, but two novelties were especially fun to try: pastel de belém and ginjinha. The pastel de belém, a small egg custard tart, is officially just found in Belém, a quick bus ride west (the big old bakery with the blue awning, unmissable), but a pastel de nata is the same idea and found everywhere in the city. The Belém version is widely hailed by locals, served warm with powdered sugar and cinnamon. Just as sweet and heavy is ginjinha, a liquor made with sour cherries and sugar. It’s sometimes served with whole cherries at the bottom of the cup, or in a cup made out of chocolate. I snagged a paper cup of it for 1.35 on Rossio Square and sat on a bench in the sun, contentedly listening to some talented buskers and turning down sunglasses salesmen and fake drug dealers. Gulbenkian-going. The Gulbenkian is a small art museum that’s worth a visit, at least if you go on Sunday like I did, when it’s free. It sort of has a tiny bit of everything, but my favorites were these René Lalique pieces: http://museu.gulbenkian.pt/Museu/en/Collection/ReneLalique. The building housing the collection is a 70s-aesthetic nightmare, but the surrounding gardens are wonderful, full of birds and flowers and private little corners for quiet reflection or making out. Fado-listening. This traditional style of music is totally captivating, and was enhanced by the atmosphere of the cozy, packed bar I heard it in (Tasca do Chico). Day-tripping. Belém, a suburb that is basically just an extension of Lisbon, Cascais, a small seaside resort town surrounded by gorgeous coastline, and Sintra, a forested wonderland full of palaces, mansions, and castles, are all within an hour of the city center and well worth a jaunt. 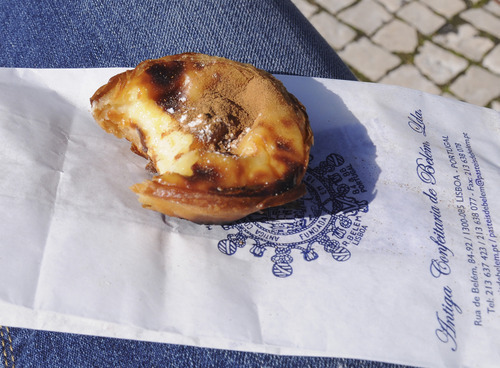 THIS is a pastel de belém with my teeth marks in it, sitting on my fat leg. Travel Time and Trip Costs: Because of a mess of delays (TAP Portugal) I won’t detail here, my travel time was atypical. However, Lisbon, though not as “dirt cheap” as it’s rumored to be, was very affordable. Once you buy a transportation card (1.40 euros for the first trip, plus .50 for the actual card), each ride within the main city zone is 1.25 euros. I only used the card to get to and from the airport and to travel to towns just outside of Lisbon, because I like exploring on foot. The average restaurant meal seemed to range from about 8 euros to 15 euros, and pastries and little snacks can easily be found for less than 3 euros. If you’re game for a mini-beer, it will only set you back about a euro in Lisbon, and it’s apparently not a big deal to drink it outside on the street or in the park. Lodging: I stayed at Living Lounge Hostel for about 10 euros a night, and it was fantastic. The place looks more like a quirky boutique record store than a hostel, decorated with fun, artsy attention to detail. It’s centrally located and about thirty feet from a major metro stop. The rooms are spacious and clean, and I appreciated the free lockers, high ceilings, complimentary breakfast, and really excellent downloadable guide to the city. Though I didn’t take advantage of it, they also offer several tours and full dinners for 10 euros.